The other day, we told you about the Vivo Apex concept phone. With a tap anywhere on the bottom of the screen activating the in-display fingerprint scanner, and audio coming out of the screen, the near bezel-less display leaves another quandary for the manufacturer; with bezels this thin, where does Vivo put the front-facing camera? The proof-of-concept OG Xiaomi Mi Mix, which was the blueprint that many of today's bezel-less handsets followed, had its front-facing camera located in the bottom bezel. That was repeated in the Mi Mix 2. The Mi Mix 2s plans on putting the front-facing camera in the upper corner of the right screen as a mini-notch. But Vivo has a better, notch-less plan. The Apex is equipped with a pop-up camera. You might be thinking to yourself that Vivo really came up with a great idea. However, a tweet from Essential's Andy Rubin (yes, the man considered to be Android's papa) revealed that a patent for a pop-up selfie snapper is owned by Essential. The patent was filed in May 2016 under the name "Apparatus and method to maximize the display area of a mobile device." Images included with the patent application show one version of the camera popping up from the top of the phone similar to the Vivo Apex. In a variation, the camera was placed in the corner and doubles as the button users would press to activate the snapper. 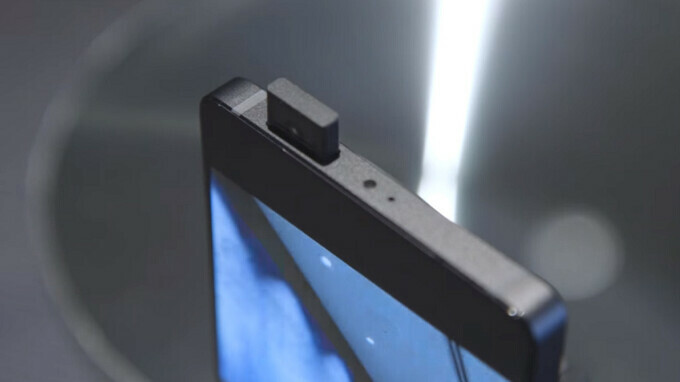 Since the Apex is just a concept, it wouldn't appear that Vivo needs to license the pop-up camera from Essential. But when Vivo is ready to mass produce the phone for consumers, it would seem a conversation with Essential might be required first. I love the Vivo Apex's design. Nearly no bezels, pop out camera for privacy and an on screen fingerprint reader. Vivo aka One plus once again with a rip off. Really? Xiaomi have had a similar Patent since 2015. Are Essential now ripping off Xiaomi too? Dumb statement buddy. That wasn't what I was replying to. The guy in post 3 was stating that Vivo were stealing from Essential. Essential may have a US patent but they certainly weren't the first to get a patent. I'd rather have a Chinese patent with 700 million potential users to sell to. Anyone can came up with this simple solution. Just because you patented it first others must pay you if they want to use this? Patent system are so dumb. Does this mean that essential 2 will have this hidden selfie cam? Cool. Sharp was the one to introduce "bezel-less" phone trend much earlier than mi mix did. Regarding pop-up camera, I think the top speaker could pop out together with the camera. That's a better solution than original mi mix had. This kind of mechanism does not save space. Instead it uses up more space within the unit and introduces new reliability issues. It used to be that the Japanese were obsessed about this kind of gimmick until Apple came around and put them right -- meaning in the current state of cost-quality balance, it's better to just make everything fixed and use software sleight of hands instead. That hasn't changed and if anything has worsened - true reliability and innovation have been harder to come by because humanity no longer respects the importance of hardware quality like we used to in the decades prior. If phone manufacturers are telling us with a str8 face that they can't find room for a headphone jack, how do they make room for this? If they do this they'd be admitting they were lying about the jack. I like this idea. I'd prefer it if the front and rear camera were mounted to this thing...would be a good way to preserve some privacy and prevent others from hacking our cameras. If Essential 2 looks like that I will give it serious consideration. I thought in china anyone can copy anyone's ideas and this so called patent rights is not needed. no thank you good bye have a nice day. more moving parts more maintenance more cost down the road (this exclude those who change phone every 6 mths or a year). i rather the current design thanks.